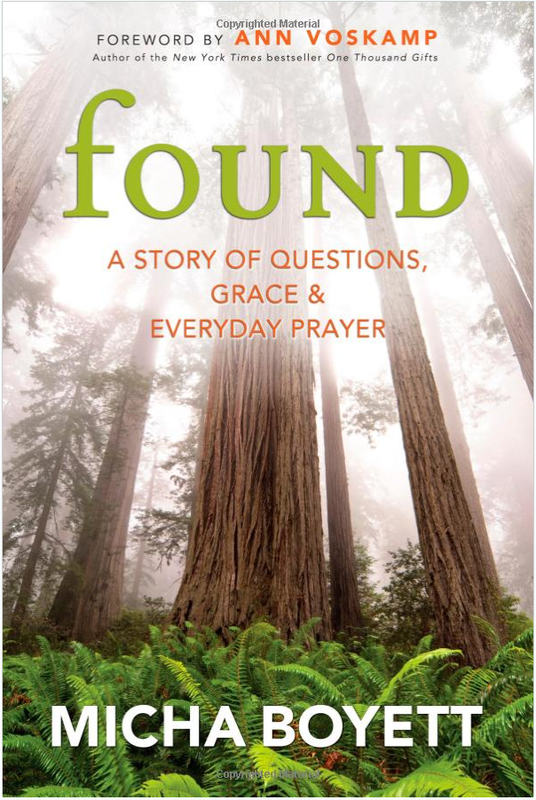 Like any good memoir, Found: A Story of Questions, Grace & Everyday Prayer is a direct look into the mind of Micha Boyett, a fascinating, real, worried, hopeful, lovely woman who feels like a friend now. There’s something fragile about her, yet persevering. Soft and quiet and intelligent and gentle, sprinkled with doubts and insecurities. Micha struggles with her faith, as we all do. The difference between her and so many others I’ve read, though, is that her doubts are more about herself than about her God or her church. Like Addie Zierman in When We Were On Fire, Micha manages to depict her personal experience and doesn’t make categoric judgments against any one church or type of faith. Micha has found God — has never really lost Him, I don’t think — but struggles to believe that He wants her ordinary self and life. She constantly wrestles with her fear that she’s disappointed Him, that she’s not giving Him enough of her life — or, rather, that her life isn’t worthy of giving to Him. The narrative is structured around Benedictine’s rules for prayer. As she connects each one to her own experience, we get a peek into Micha’s inner prayer life. The things she writes are so genuine and thoughtful and real — and her prose is delicious. I wanted to devour the book because I was so interested in what else she had to say, but the beauty of her words made me slow down, reflect — just as she’s learning to do in prayer. It’s funny. I read it and see how vibrant her prayer life is. How much she loves God. How He speaks to her, abides with her. And yet, so much of that is hidden from her sight. It’s not clear from within. I think the same could be said about most of us. We beat ourselves up. We say we believe God is Who He says He is, that we really want to know Him, then we let ourselves believe that we don’t measure up. That we are not enough. Haven’t done enough. Don’t deserve to be there. Don’t know why He would want us in the first place. But if we truly understood Him, we’d know how wrong we are. When we start to fathom who God really is, we can either fall on our faces in awe or let our own failings be illuminated by His light. Micha recognizes and portrays a God who she clearly loves, who she’s spent her life trying to emulate and grasp. And through her honesty, we see His light shining through her, in and around and radiating out of her. And the beauty, the absolute beauty of this woman, is that she doesn’t ever seem to know how brightly He shines through her.